In 1977, three men from Long Beach, Don Anderson, Craig Furlong and Tim Bryant were leading music in their adult church class. It was their custom to invite someone, once a month, to do special music there. After a few months, the three thought "why don't we work up some music for class and be the special music one time." All three played guitar, but Don was taking banjo lessons. Tim already played bass from his "rock" days, and Craig, originally a drummer, elected to play guitar. And so the three men worked up the singing and playing of three songs for the "special" music for their class. In April of 1977 the day came for them to "perform" for their one time appearance. Quite to their surprise, their music received an overwhelming response. After the class was over, the folks in the room next to theirs, having heard their music through the walls, approached them and said, "Of course you are going to play for our class next week, aren't you?" Not wanting to disappoint anyone, the men with a repertoire of three songs said, "Sure, we will be glad to." The next week while Don, Craig and Tim were doing a sound check for the other class, the church Minister of Music heard them rehearsing. He quickly approached them, and said, "You guys have just got to play for the whole church." Shortly after that, the fellows played for a congregation of around 2500 people, again receiving a highly enthusiastic ovation. Before they knew it they were being asked to play for other classes, socials, and finally as their "word of mouth" reputation grew, for other events outside their own church. They quickly began to expand their repertoire so they could play full concerts. One of the first songs they learned was one they heard on a Bill Monroe and the Bluegrass Boys record. It was called "When The Angels Carry Me Home." As they looked to expand their repertoire back then, it was hard to find gospel bluegrass that said things the way they would like to hear them said, so they began to write and perform their own songs. Their original compositions have received national songwriting awards as well. In 2003 Bluegrass Brethren was a main stage "showdown" band representative at Huck Finn's Jubilee in Victorville, CA. 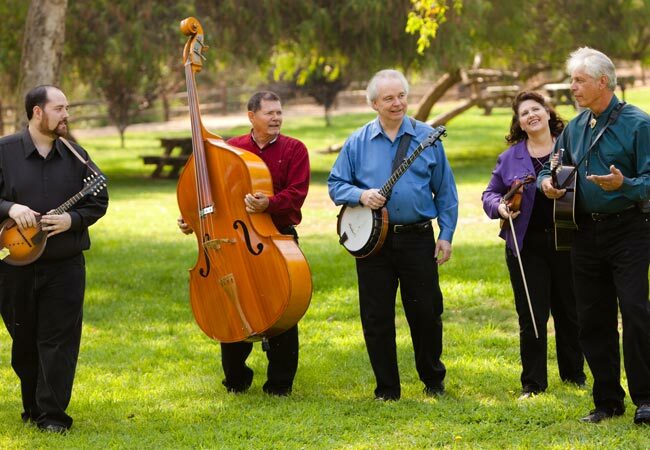 Besides keeping a busy concert schedule, they have appeared at festivals, including, Huck Finn's Jubilee in Victorville, Julian, Gospelgrass -Colorado, The Temecula Bluegrass Festival and many others. That little trio, that started 30 years ago, with really no expectation of becoming a permanent group, today has expanded to a band of five. Tim plays guitar and is Bluegrass Brethren's last remaining "original" member. He is the groups primary song writer and to date he has over 100 songs to his credit. He has a "countryish" sounding baritone voice. In concert he is known for asking the audience lots of questions and for his fun-loving personality. He has been performing with the group since its beginning in 1977. Les is known as Bluegrass Brethren's "quiet one" but his multiple instrumental talents speak for themselves. Since 1992, Les has been adding his musical gifts on banjo, mandolin, and guitar to the ministry. He sings baritone and bass too. Lori is now the band's fiddle player. Originally she played the bass when she joined in 1997. Her fiddle playing is very tasteful and her vocals add a refreshing, beautiful twist to Bluegrass Brethren songs. Joining the group in January of 2002 as the bass player, he has moved on to play the mandolin. He also specializes in Duo style mandolin. He sings tenor and lead vocals and his warm tones are a great addition to the group. Jerry is our very dedicated bass player. He has years of experience on bass and various other instruments. His steady heartbeat keeps us all on track.